Jordan Reges lets loose with a shot against Shaler during the Butler High School bowling team's season opener at Family Bowlaway. Reges paced the Golden Tornado with a 622 series as Butler's boys and girls teams won by 7-0 scores. BUTLER TWP — Butler's varsity bowling team opened its season with a 7-0 boys and girls sweep of Shaler at Family Bowlaway. 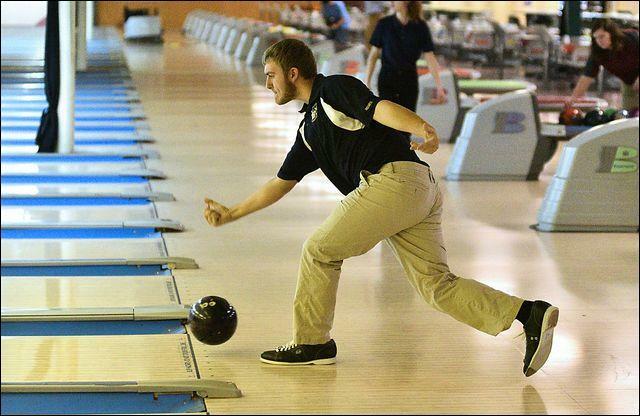 Jordan Reges rolled a 622 series for the Golden Tornado boys while Shawn Marcellus had the team's high game of 235. Butler won total pins by a margin of 2,710-2,019. Mercedes Belch paced the girls with a 604 series and high game of 224. Nicole Nebel added a 568 series and a high game of 201. The Tornado girls won total pins 2,661-1,923.